LeBron James has captained several Superteams, but this Finals squad is not one of them. To overcome the 2018 Warriors, he'll need multiple legendary performances—and it still might not be enough. OAKLAND, Calif. — The 2018 NBA Finals will be defined by upheaval, not continuity. 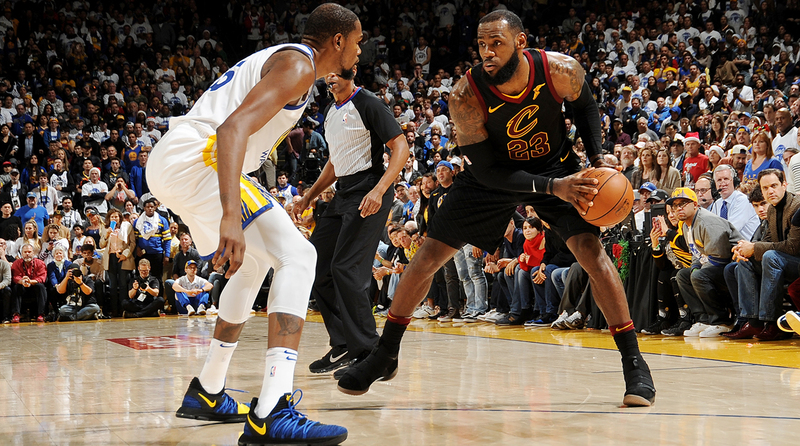 That’s a strange thing to say, given that the Warriors and Cavaliers are squaring off for a record fourth straight year, but it’s true: While these Cavaliers are still led by LeBron James, they bear little resemblance to the 2017 Finals version or even the 2017 Christmas Day version. Kyrie Irving, a Finals standout in both 2016 and 2017, is the biggest name missing, long gone after forcing his way out of Cleveland last summer. Joining the All-Star point guard in the ranks of ex-Cavs are seven other players who were active for Game 1 of last year’s Finals: Channing Frye, Deron Williams, Iman Shumpert, Richard Jefferson, Danhtay Jones, Derrick Williams, and James Jones. What’s more, Cleveland enters the Finals without three of its top seven players from its most recent meeting with Golden State, back in January: Dwyane Wade, Jae Crowder, and Isaiah Thomas were all shipped out at the deadline. Not to get too dark, but the Cavaliers will also try to upset the Warriors without Paul George, an off-season trade target who would have perfectly addressed their biggest match-up need in this series: a Kevin Durant-stopper. They also might open the Finals without All-Star forward Kevin Love, who missed Game 7 of the Eastern Conference finals after being placed in the concussion protocol. James has captained numerous Superteams; this group, which ranked No. 29 in defensive efficiency during the regular season, is not one of them. By comparison, Golden State’s recent hiccups look pedestrian. The Warriors return virtually their entire rotation from last year’s Finals, including a core group of Stephen Curry, Klay Thompson, Draymond Green and Andre Iguodala that has accumulated a 12-6 Finals record against James since 2015. 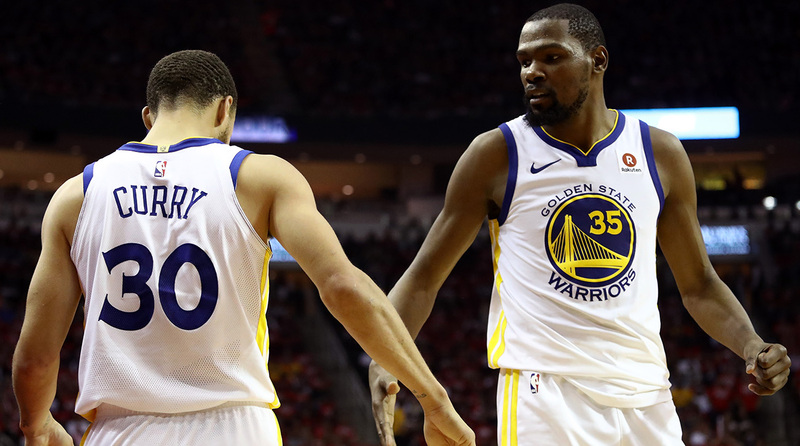 Although they looked vulnerable for long stretches of their seven-game Western Conference finals series against the Rockets, the defending champs have played high-level offense (No. 2) and defense (No. 1) throughout the postseason. They have also cycled successfully through complicated mid-series adjustments and kept their composure during tense moments. Oh, and they also have Kevin Durant. Steve Kerr’s team hasn’t been as consistently dominant as last season, but it is explosive, determined and incredibly well-tested by Houston. The Warriors are, still, a juggernaut. Their biggest concern, easily, is a lingering knee injury for Iguodala that kept the versatile wing out of the final four games of the West finals. Otherwise, the Warriors have every reason to believe that they have widened the gap since trouncing the Cavaliers in five games last year. The series will open Thursday at Oracle Arena, where Golden State is 8-1 with a league-leading +16.3 margin of victory in the playoffs. In other words, James’s new-look supporting cast will be thrown straight into the hottest fire imaginable. If this series is to become more competitive than most expect, the Warriors will need to play an active role in their own demise. The most direct path to implosion? A civil war between Curry and Durant for control of Golden State’s offense. The Warriors showed signs of breaking against the Rockets, who switched aggressively on defense and encouraged Durant to play in isolation. It took multiple games for Golden State to work through its counters, which involved putting Durant in situations where he could make simpler passes and do less thinking. The Warriors’ signature ball movement eventually picked up, the clean looks reappeared, Curry found more time and room to operate, and their collective talent won out in the end. After Game 7, though, Durant, Curry and Kerr all admitted publicly that the stresses they faced snapped the Warriors out of the easy-going, drama-free existence that they enjoyed throughout the 2017 postseason. Unfortunately, the Cavaliers don’t seem ideally suited to mimicking the Rockets’ defensive success. They don’t have a high-level defensive match-up for Durant, like Trevor Ariza, which could force James to take on more of that burden this year. They don’t have a cast of physical wings, like P.J. Tucker and Luc Mbah a Moute, that they could use to deploy interchangeable, switch-heavy lineups. They don’t have a proven Curry-stopper and therefore must rely on George Hill to deliver the series of his life. And they don’t have an elite rim-protector, like Clint Capela, to clean up the blow-bys and back-cuts that arise when playing pressure defense on the perimeter. Most Intriguing Lineup: LeBron at center? In years past, Cleveland has struggled to keep its centers on the court against Golden State. Going small to exploit the clunky Timofey Mozgov in 2015 turned out to be checkmate. In 2016, when the Cavaliers won in seven games, Mozgov was deemphasized in favor of Tristan Thompson, who played excellently, and Love, who struggled for much of the series. Then, in 2017, the Warriors succeeded in neutralizing Thompson with size and committed rebounding. He finished as a team-worst minus-41 and Love was right behind at minus-35. That felt like checkmate again, although Cleveland was forced to return the same personnel. The Cavaliers’ centers—Thompson and Love—have been good in the 2018 playoffs, but both clearly have issues against Golden State. Thompson is a relatively versatile defender, but he still isn’t ideal against five-out lineups and he’s a non-shooter who shrinks the court for James. Love is a talented scorer and reliable shooter, but his health is uncertain and he’s easy to pick on given his limitations defensively in space. Last year, nine of Cleveland’s 10 most-used lineups in the Finals included either Thompson or Love. At some point in the coming weeks, though, coach Tyronn Lue might conclude that his best match-up for the Warriors is to play James as a de-facto center, especially when Love is off the court. Doing so would maximize offensive spacing around James by, say, deploying Hill, J.R. Smith, Jeff Green and Kyle Korver simultaneously. That hypothetical group would still include Cleveland’s best individual counters for Durant (Jeff Green) and Curry (Hill), while allowing James an easier defensive assignment on Draymond Green, who has struggled with his perimeter shooting throughout the playoffs. Playing small ball could also potentially open some minutes for Rodney Hood who, while useless for the last month, matches up with Golden State’s wings better than most of Cleveland’s other options, at least on paper. James’s energy management will be at the heart of Cleveland’s lineup decisions. Asking him to serve as the back-line defender for long stretches might be asking too much given his humongous offensive workload. Even so, here’s hoping for more James-at-center lineups, as the results would likely be more potent and entertaining than alternative looks that failed last season. James enters the Finals having already logged 3,769 minutes this year, thanks to his league-leading 743 minutes in the playoffs and his league-leading 3,026 regular-season minutes. He will likely finish this season logging more total minutes than he has since 2011, when he was 26 years old and still hadn’t won a title. By comparison, Durant has logged only 2,967 total minutes this year, a difference of more than 16 full 48-minute games. That’s a lot and the difference will likely show as this series wears on. It’s worth noting that James and the Cavaliers lost more games to Eastern Conference foes in this year’s run-up to the Finals (6) than they lost in the last three postseasons combined (5). In other words, James has already had to dig much deeper before facing his toughest test. Despite his stunning postseason numbers (34 PPG, 9.2 RPG, 8.8 APG), James repeatedly showed signs of fatigue against the Pacers and Celtics. He must now face the Warriors, who are faster, more athletic and more mentally draining than anything the East has to offer. Look for early warnings signs on the defensive end, where James has largely been able to get away with missed rotations in these playoffs. The story of Iguodala’s ability to make James work has been told over and over since 2015, when he took home Finals MVP honors for his diligent defense. Aside from Kawhi Leonard, the 34-year-old Iguodala might still be the NBA’s best LeBron-stopper given his familiarity with James’s tendencies, his immense basketball intelligence, his quick hands, and his size and strength combination. Iguodala’s (plus/minus) impact during the first three Warriors/Cavaliers Finals has been unmistakable. All told, Golden State is +141 over the last three Finals with Iguodala on the court and minus-68 when he’s out of the lineup. While the Warriors can rotate Durant, Klay Thompson and Green on James if Iguodala remains out, his absence would be no trifling matter. Cleveland’s title hopes require a string of legendary performances from James, and his life will be meaningfully easier whenever Iguodala isn’t shadowing him. Last fall, The Crossover unveiled its annual “Top 100 NBA Players of 2018” list. For the second straight year, James, Durant and Curry ranked 1-2-3. And, for the second straight year, all three will play in the Finals and potentially vie for Finals MVP honors. There’s a compelling story around all three names. Curry, a two-time MVP, has never won a Finals MVP. Despite his numerous successes, he’s still seeking a crowning individual postseason achievement. Durant, meanwhile, got an extended taste of the blame during Golden State’s wobbly series against Houston. But he was the dominant force in the 2017 Finals, earning MVP honors, and he figures to roast Cleveland’s ill-matched defenders again in this series. And then there’s James, whose remarkable postseason run has already included three triple-doubles and seven 40-point games. With one more 40-point night, he would tie Jerry West (1965) for the most 40-point nights in a single postseason run. If Cleveland upsets Golden State, James is a lock for his fourth career Finals MVP award. Winning a title this season would arguably be even more impressive than his 2016 title, given that it would come against Durant and without Irving’s help. As it so happens, West (1969) is the only player to ever win Finals MVP honors without playing on the winning team. Could James have a Finals MVP case even if the Cavaliers fall? Remember, he drew some Finals MVP attention back in 2015 even though he lost the Finals. His reputation has only grown since then, and his value to the Cavaliers has only increased given all the moves made around him. It’s conceivable, then, that James will find a way to surpass West in the record books for 40-point games and match his unique Finals MVP award too. Houston proved that Golden State isn’t invincible, but Cleveland’s mish-mashed roster doesn’t appear up to the test. Too many new faces, too many inconsistent performers, and too many defensive liabilities. If the Warriors play to their capabilities, they have a chance to sweep the Cavaliers even without Iguodala. In the more likely event that their attention to detail wanes, James should be able to make them pay at least once. Anything past that would reflect poorly on the Warriors’ significant talent, chemistry and experience advantages. A third title in four years would rank as the most dominant stretch for any NBA team since the Lakers won three straight titles from 2000 to 2002. Remarkably, it would put the Warriors in position to chase their fourth title in five years come 2019, a feat that hasn’t been accomplished since the 1960s Celtics. Kerr and company aren’t just competing for fleeting glory, they are rolling towards the rarest of history.